Digital controllers are part of nearly all modern personal, industrial, and transportation systems. Every senior or graduate student of electrical, chemical or mechanical engineering should therefore be familiar with the basic theory of digital controllers. 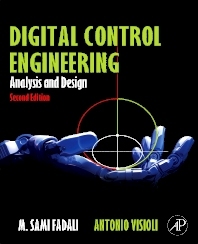 This new text covers the fundamental principles and applications of digital control engineering, with emphasis on engineering design. Fadali and Visioli cover analysis and design of digitally controlled systems and describe applications of digital controls in a wide range of fields. With worked examples and Matlab applications in every chapter and many end-of-chapter assignments, this text provides both theory and practice for those coming to digital control engineering for the first time, whether as a student or practicing engineer. Professor and Chair of Department of Electrical & Biomedical Engineering, College of Engineering, University of Nevada, Reno, NV, USA. Full Professor in Control Systems at the Department of Mechanical and Industrial Engineering of the University of Brescia, Brescia, Italy He received the Laurea degree in Electronic Engineering from the University of Parma in 1995. From September 1994 to February 1995 he was an ERASMUS student at the Electrical and Electronic Department of the Loughborough University of Technology (now Loughborough University), UK. From September 1995 to November 2012 he was with the Department of Information Engineering (formerly, Department of Electronics for Automation) of the Faculty of Engineering of the University of Brescia . In 1999 he received the Ph.D. degree in Applied Mechanics from the University of Brescia. He is a senior member of IEEE, a member of the IFAC Technical Commitee on Education, a member of the Technical Committee on Education of the IEEE Control Systems Society, a member of the subcommittees on Event-Based Control & Signal and on Industrial Automated Systems and Control of the IEEE Industrial Electronics Society Technical Committee on Factory Automation, and a member of the national board of Anipla (Italian Association for Automation).